Well, the first day is kicking off on the second, but I hope you’ll forgive me for being a day late! I realize that not everyone has children and that sadly, there are people who long for children who cannot have them. My heart goes out to you. Please know that I am not intending to leave you out on day one. The fact is, today is my oldest daughter’s eighth birthday. For me, personally, it’s a reminder to give thanks for her and each of my children, both the ones who are alive and the one who is not with us. Whether you have children or not, you can be thankful for what children teach us about God, parenting, innocence and love. 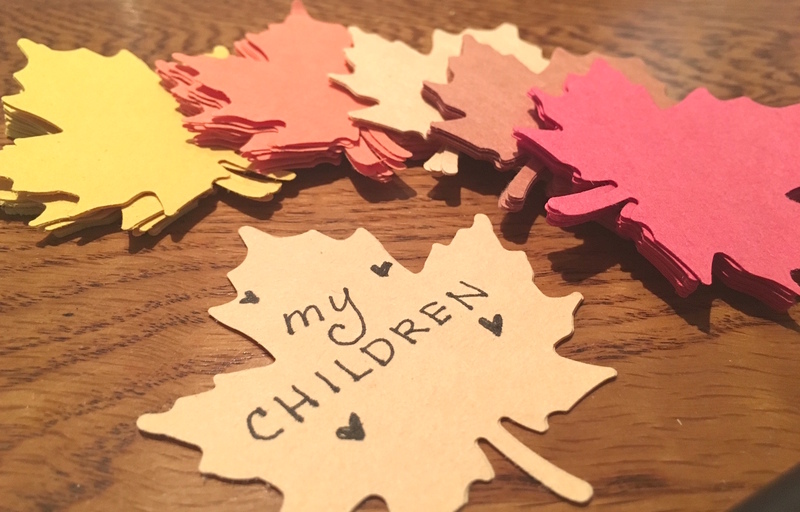 Why am I thankful for my children? 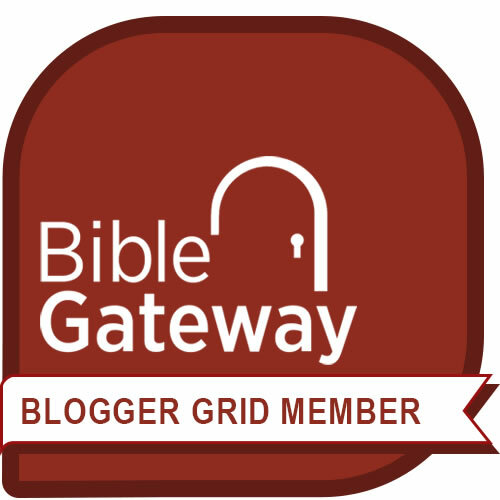 I am thankful for the insight they have given me about God. In the book of Hosea, the prophet takes a prostitute for a wife and personally and intimately discovers the pain of rejection and infidelity. In like manner, being a parent gives us an intimate glimpse into how God looks on us as our Father. Raising and training children has taught me the joys and heartaches of what God feels when we disobey, reject, stumble, or conversely obey, praise and give thanks. I am thankful for the humility they’ve taught me. As I mention earlier, my oldest daughter turned eight today. When we learned that we expecting again, there was so much fear and joy. We had lost our first child in what the doctor’s refer to as “a common miscarriage.” There was a gnawing fear that we would lose this one too. She came into the world one year after the day on which the doctor had pronounced that we had miscarried our first baby. She was (and still is) a gift from the Lord. All that being said, she has been the most challenging of our three children, testing us at every turn, thrashing our ideal picture of parenting and crushing many of our theories on how to raise children. She has reinforced some of our theories, but not all. There have been many tear-filled days and nights, many prayers of “why” and “what do I do?” and earnest pleas to the Lord for more wisdom. It’s only been within the last few years that we discovered that she had a neurological disorder. We’ve been treating the disorder and things are improving, but for a very long time, we agonized over her. We felt we were failing as parents. The whole ordeal endowed us with unasked for humility. You seasoned parents laugh away, because you know what I’m talking about. I think we’ve all verbalized or thought something similar only to have our kids completely demolish our preconceived ideas. To all you new parents, just remember that your children are not robots and you have to train them. They will not always conform readily to your training no matter how diligent, consistent or persistent you are. It may turn into a battle. I am thankful for the humility because it has given me greater compassion towards all parents. I am not so quick to mentally criticize because I know how unpredictable kids can be! I also approach situations with more caution and care because I don’t always “know it all.” Everyday I ask God for wisdom because I know I don’t have it all figured out! I am thankful for the inconveniences. I remember one day, after the floor was freshly mopped, my kids came running in from their play outside. The concrete outside was covered in chalk drawings and my shiny wood floor was now covered in chalky footprints (and paw prints). I groaned with irritation—“As if we don’t have enough to do! I’ve got to clean this again!” But as I looked down at that small little chalk footprint I realized something. Just like the chalk will fade away, so will the size of that sweet little foot and the joyful belly laugh that came through with it. These days are fleeting. They will be gone before I know it. I am thankful for the bad days—they teach me more appreciative for the good ones. It could be that you and your child are constantly at odds with each other. Take time at night to walk into their room after they’ve fallen asleep. All the issues of the day will have dissipated from their face and you will again see the little child that has touched your heart so deeply. Pray for them and pray for wisdom. Be thankful for kids you mentor. It could be you do not have children of your own, but you can be part of the lives of other children. I had great mentors who were the same age as my parents that took me to the symphony or on camping trips with other kids or just let me tag along in a group. They were like aunts and uncles to me and such a blessing to my life. Don’t allow what you lack to blind you to the needs of others. Before I end this post, I want to share what we are doing in our home to encourage our kids to think more about thankfulness. I’m sure some really creative moms and dads can come up with something way more aesthetic and clever, but Martha Stewart doesn’t live at our house. Simple is the game around here. 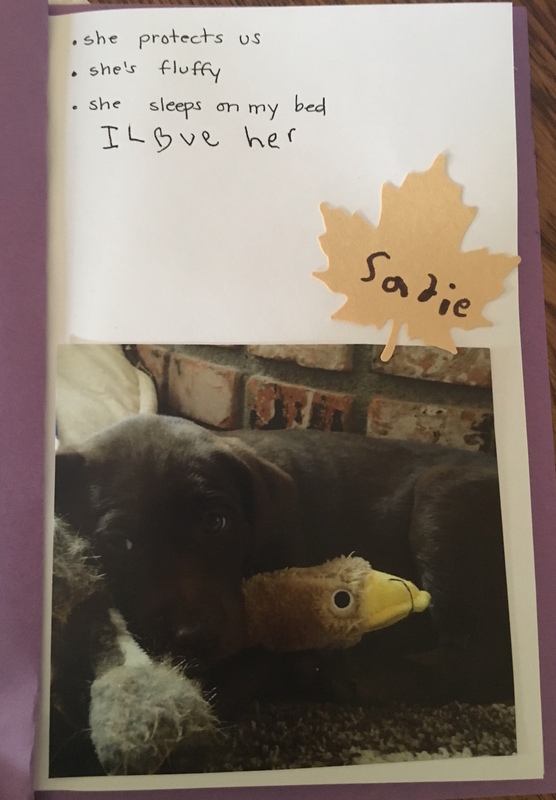 Today, my two youngest kids picked out their dog, Sadie. It’s meant to be a simple daily activity that doesn’t take more than a few minutes. What are you thankful for today? 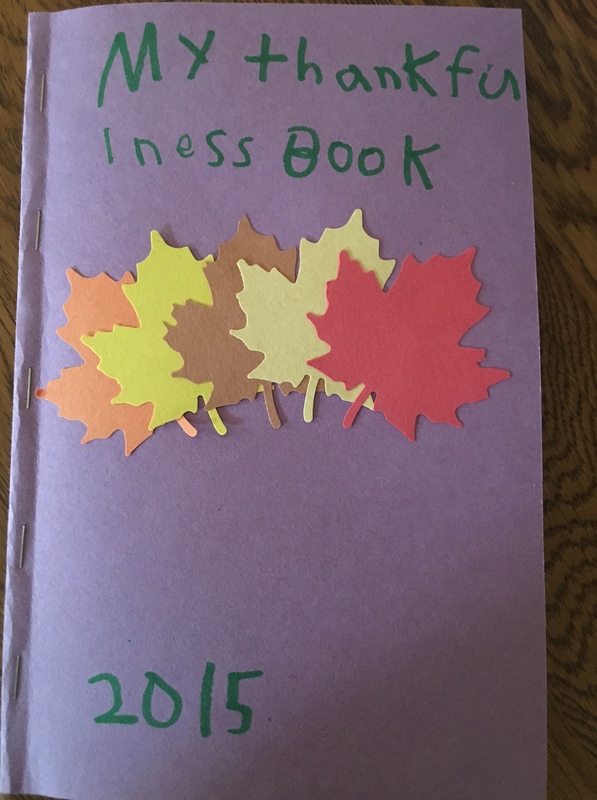 What ideas can you share for teaching your kids about thankfulness and gratitude? Please leave a comment below and share your ideas! This brought a smile to my face. I love the pictures that the children drew. Looking forward to other “thankful” posts. Yes, every season brings its ups and downs, doesn’t it? I’ve tried very hard to enjoy each little stage… sometimes that is more challenging depending on the stage! It forces me to dwell on the present and not lament the times that are past. I’m sure your grown children bring you new joys now. Maybe someday, Lord willing, you’ll get to enjoy grandchildren too! Thanks, Debbie! I am sorry that your daughter has dealt with so many miscarriages. They are so painful—for both the husband and the wife. I’ll be she treasures those daughters she has very much. I always appreciate your encouragement and comments, Debbie. God be with you as well! Thanks, as always! God bless. You’re very welcome Elihu! Lord bless you too my friend! Indeed children are what God expects us to become. Mature enough that you can be like a child. Missing tools, supplies used up on what the kids thought were treasures. Treasures indeed. Reminds me to be thankful to the Lord for my kids! you make blogging look easy. The overall look of youyr website is wonderful, as well as the content!